T206 HOFers that aren't the "big ones"
I am considering adding some graded T206 HOFers to my collection. Obviously, players like Cobb, Mathewson, Johnson, and Young are "the" cards to own. My budget won't always permit that, however. What about the next tier of HOFers such as Tinker (the hands on knees pose is awesome! ), Lajoie, Bender, etc? If purchased at a reasonable cost, are they considered solid purchases, too? I figure I would be looking in the PSA/SGC 2 or 3 range. Thanks for the input. Last edited by vintagebaseballcardguy; 04-14-2019 at 03:21 PM. keeler batting is a sweet pose! Keeler is a nice one. You can get some other pretty great players fairly cheap (compared to Mathewson et al.). Eddie Collins, John McGraw, Ed Walsh, Rube Waddell, Nap Lajoie... Speaker would be at the top of that list, but people think it's his rookie card. Of those names you listed, I have especially thought about Lajoie and McGraw. I guess my hesitation with McGraw is that I would in essence be purchasing several manager cards. He was a larger than life figure though. I am sure there are plenty of McGraw collectors out there. Lajoie and Speaker are getting to be pricey too. Some of the others are tough, depending on the pose you want. I would add Baker, Crawford, and Mordecai Brown to your list. Some of the portraits of HOF pitchers are very appealing: Walsh, Bender, Marquard, Waddell, Chesbro, etc. I have always been partial to Waddell Throwing. Beautiful artwork and, as a non-portrait, has not been bid up quite as much lately. Also agree on Keeler w/Bat but he’s a little more spendy. If you want to go budget try Chance Yellow Portrait or Evers Yellow Sky. Nice looking cards but since there is a larger supply (because they are “superprinted”) they are a little easier on the wallet. Last edited by sreader3; 04-14-2019 at 06:49 PM. I've always thought the Walsh portrait was underpriced and that it is a very nice looking card that doesn't show up all the time. Just my thoughts. I agree - the yellow Chance is a solid card. Chance is a legit HOFer and a Cub (good combo), and because the card was super-printed, there are many around and you can even get a rarer back (plenty combos to choose from) for a decent price. Regardless, buying any t206 HOFer in my opinion is a fine idea. Thanks for all the input, guys. I also like the looks of the Tinker Hands on Knees. 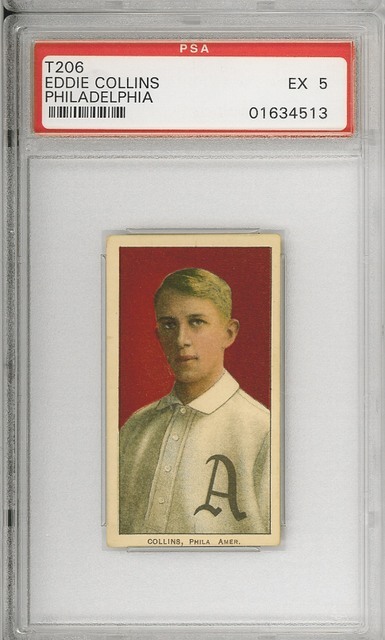 Later this year, I hope to be able to get a red portrait Cobb and perhaps a Mathewson or Big Train. Last edited by vintagebaseballcardguy; 04-14-2019 at 08:27 PM. There's several threads, if you do a search, that breaks down the various HOF "tiers" in the T206 set...as I wouldn't include Tinker or Bender in the "next tier" as you say. You might also consider portraits of "the trio of bear cubs"; all three come with the gray "Cubs" shirt. Last edited by Exhibitman; 04-14-2019 at 09:55 PM. Agree about the Waddell. Its the only T206 card that I own and its a beauty. --ANY HOFer is a pretty safe buy! As far as I know, NONE of them take a sudden dip in price or value. Correct me if I speak in error. Tris Speaker is definitely at the top of the list below the 4 you picked. Eddie Collins is the most underpriced. He should be in the tier with Speaker and Lajoie, but sells for less. I would also agree with Keeler. Those would be my next 4. The Lajoie Portrait is definitely knocking on the door of moving "up" in tier, the prices are going in one direction. Plus, it's a GREAT card. I like Crawford in that "third tier HOF group." The Baker is probably the last HOFer I upgraded and I think I got a pretty presentable one for $90 or so. I agree Collins is an amazing card...all photographic evidence would indicate that that portrait was done during the six months of his life that he looked the best he ever would. Lol...I’ve always thought the same thing. Thanks for all the good ideas, guys. I really do appreciate it. Up until recently, I was a set builder (mainly postwar) and had tried that approach the two different times when I dabbled in T206. That approach led to failure. Now I am busting my sets and strictly going the slabbed HOFer route. This has strangely simplified things for me. It just hit me this weekend that this HOFer route could include T206, and I got really excited! Those other times when I tried and failed, it was mainly because I was bogging myself down with commons. This will be a lot more fun, just picking up HOFers of prewar players...and not just T206. I am a little frustrated at the price point of the red portrait Cobb along with Mathewson and Johnson, but I will eventually be able to land one of each of those players, too. For the most part, however, I will be targeting the names you all have been throwing out. Hughie Jennings HOF'er has 3 cards in the T206 set. I think if you posted these two photos and you didn't KNOW who it was you'd probably hear," I don't think it's the same guy." "Ears are different." "Don't see the resemblance." Of course all of this discussion about HOF T206 cards has led me to surf Ebay, just looking around. You guys have made some great HOF suggestions which have naturally led me to...the Hal Chase pink and blue portrait cards. I just can't get out of my own way! I haven't bought anything at this point, but those two cards are sweet IMHO, even if he isn't a HOFer. Just leave it to me to go off track! Maybe focus on banned players/Black Sox? Chase, Cicotte, Gandil, Sleepy Bill Burns...Eddie Collins, just due to being on the 1919 Sox, and also being a 3k hit HOFer. Last edited by MVSNYC; 04-16-2019 at 08:38 PM. I went the way you are thinking about a number of years ago and do not regret it at all. I still pick up commons that I think might be elected like Dahlen, or guys like Chase, but I feel no need to pick up a bunch of commons that I could care less about. It might not work for everyone but it sure works for me. Good luck. 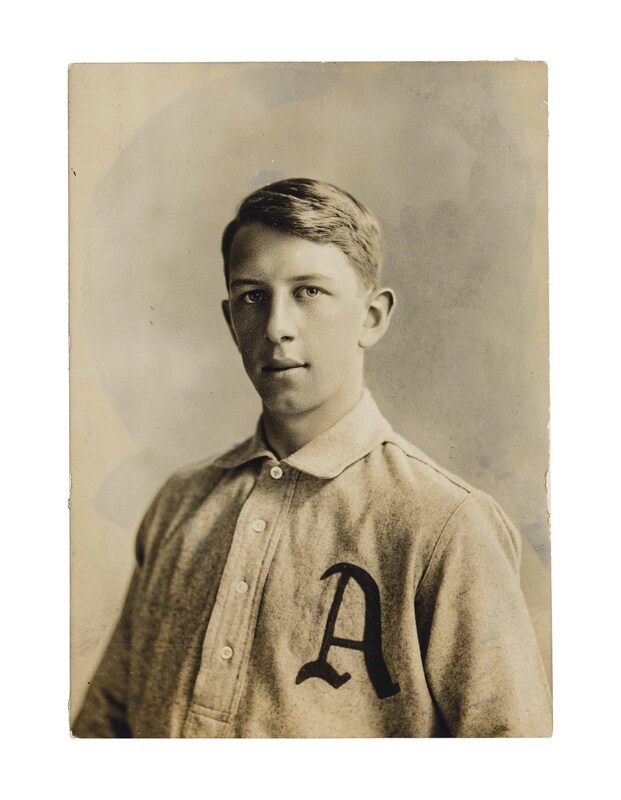 I’m a big fans of Eddie Collins and Homerun Baker. Outside the box picks would be Zach Wheat, Iron Man McGinty, and Chief Bender Portrait.